A little more than 140 Roseburg High School students hit the football field in their new marching band uniforms. Standing in formation, they began to play. The first notes of that brand new song propelled the audience on a journey. Emotions throughout the stadium swelled. Then a remarkable thing began to happen: the marching ensemble, one of the biggest in the state, began to move. The energy of the music synced perfectly with their choreography. For a brief moment, everybody forgot about football--this was the band’s moment of glory. Watching from the stadium, Lori Adams knew what her band kids were feeling because she felt it, too. No, Lori isn’t the band director. That distinction belongs to Branden Hansen. In fact, she is something even more remarkable. 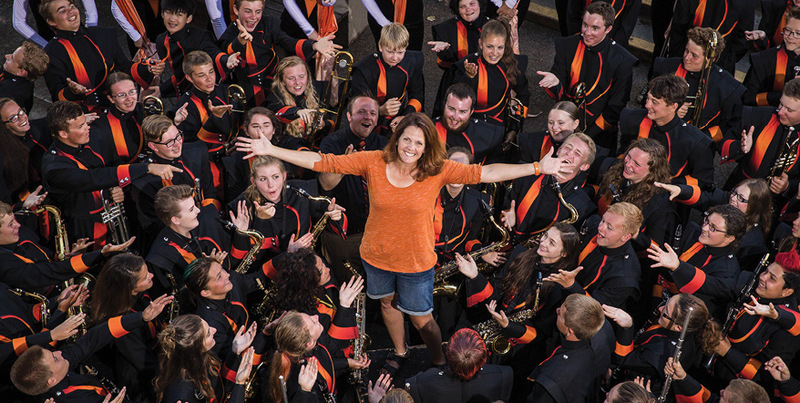 She’s a band mom on a mission: to propel band kids to high school stardom and beyond. Lori was quickly elected as publicity chairperson for the parent group. As promised, a website, logo, and enhanced fundraising were introduced. Things began to happen fast for the Roseburg High School ensemble. “Our big moment came when the band was cast in a television commercial for Coastal Farm & Ranch,” she said with an infectious smile. “The kids played the company’s theme song and company got behind us in a big way. The whole community did too.” New uniforms were funded through nonstop fundraising and local business support. With those new uniforms, the band recruited new kids too. That fact became clear in the days that followed the shooting at Umpqua Community College on October 1, 2015. The Roseburg High School marching band was scheduled to appear at a statewide marching band competition in Sprague in the days that followed. But with all class activities cancelled until further notice, all the kids could do was go and cheer on the other schools. And that’s just what they did—earning a special place in everyone’s heart. Today, the band shows no signs of slowing down. As president of the parents association, neither does Lori. Lucky for everyone, her son also joined the band and has a few years left in high school. At Northwest Community Credit Union, we applaud the uncommon. Like us, Lori is dedicated to a cause — building a better community for everyone. So whether she’s buying dozens of Costco pizzas or stocking up on hundreds of bottles of water with her Northwest Visa® Rewards Card, we’re proud to be there—to help her keep that huge group of ravenous and talented teens marching to the beat of a loving and supportive community.